Happy Saturday! 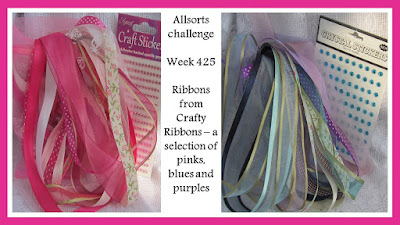 This week it's Helene's turn to host the challenge at Allsorts and she would like to see "Fancy Folds". I decided to make a "Joy Fold" card. This card was really easy to make .... the base is 8 1/2 x 4 1/2 scored at 3 inches. The little card inside is 3x6 inches, scored at 3 inches. I cut designer paper to fit the card, adhered to the base and little flap, then adhered the little card in the middle of the card base. I added some striped twine to the little card and stamped flowers inside. Hope you come join us this week for a chance to win a fun ribbon prize package by Crafty Ribbons. Wow! I L-O-V-E your card. The folds are cool and the image is just perfect with the background papers. Thank you for inspiring me. A very interesting fold Ellie, perfect for the theme. This is a really fabulous shape of card and with a lovely image and papers. What a gorgeous card Ellie - love the flowers on the inside of the card folds - the perfect accent. What a great fold and as usual your colouring is fab.